Officials have released the first photo of the three heroic Thai Navy SEAL divers and medic who spent days treating and comforting 12 boys and their soccer coach in a Thai cave. The three Royal Thai Navy SEAL divers and medics who stayed in the cave with the boys and coach since they were located on July 2. Officials said they emerged from the cave "healthy" shortly after the last rescues were made, July 10, 2018. 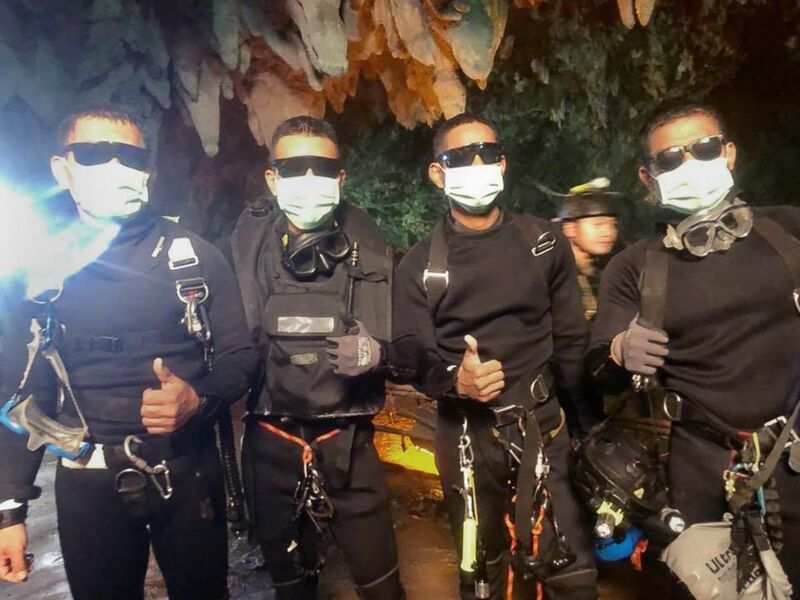 Wearing surgical masks, wetsuits and sunglasses to shield their eyes from the bright emergency floodlights, scuba gear dangling from their waists, the fearless four struck a pose at the mouth of the Tham Luang Nang Non cave for a quick snapshot after the life-saving mission was complete. The divers and medic, whose names were not immediately released, were all healthy after making the arduous journey out of the underground maze from the chamber nearly 3 miles deep where they helped the once wayward group and kept them calm as plans to extract them were being hatched, officials said. Rescue teams walk inside cave complex where 12 boys and their soccer coach went missing, in Mae Sai, Chiang Rai province, in northern Thailand, July 2, 2018. The boys and their coach went missing on June 23 and they were located by a team of British cave divers who stumbled upon them on July 2 while they were stringing a safety rope for rescuers to follow. 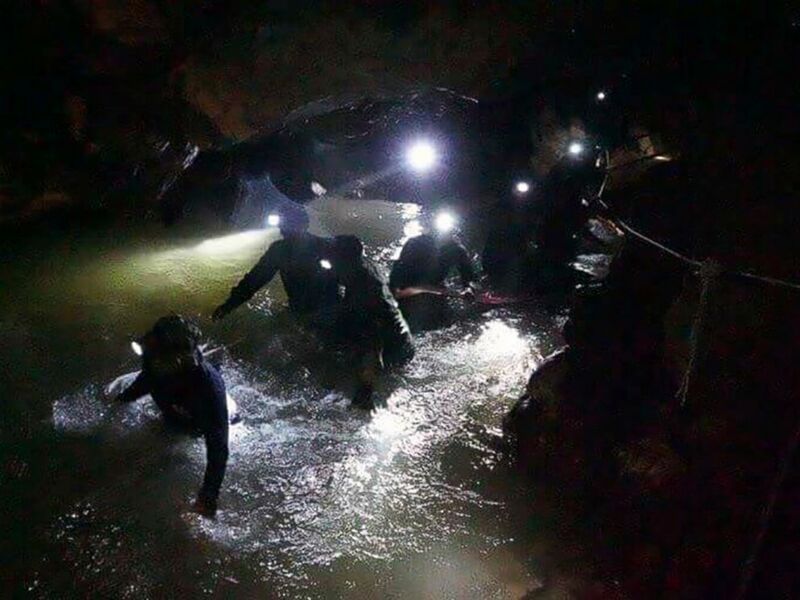 While other rescuers left the cave to fetch help and supplies, the four Thai Navy SEALs and the medic stayed with the members of the "Wild Boar" youth soccer team. The divers and medic were taken by ambulance to a hospital in Chiang Rai to be examined as a precaution, officials said. When they arrived at the hospital, a crowd of well-wishers gathered outside, cheering and applauding them just as they had done earlier when the last rescued boys and their coach were driven into the hospital emergency bay. 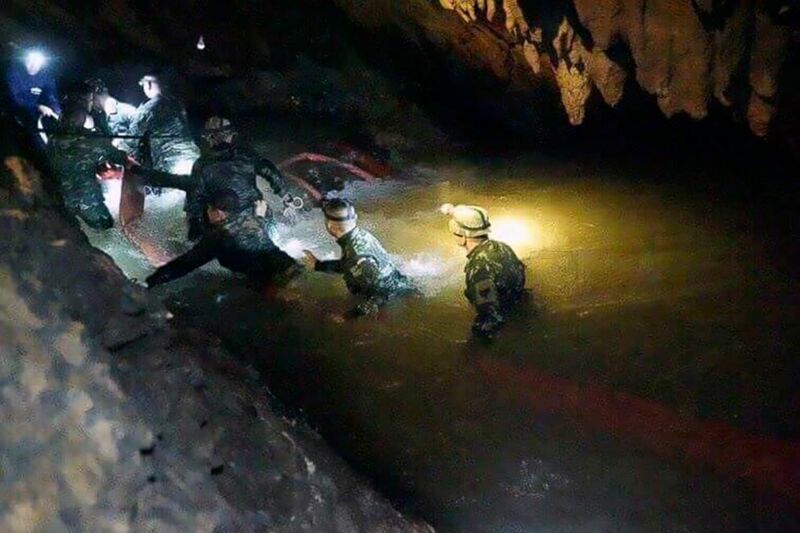 The Royal Thai Navy SEALs also confirmed the four were out – writing in a Facebook post in English, "All 4 Thai Navy SEALs came out safely. Hooyah Hooyah Hooyah."